This is something I've been working on and has been under some discussion with some HEMA people I know. I would like to see what people here have to comment. The ultimate goal of creating this typology is to put sparring equipment in a more useful context and facilitate the development of what I would call "FOURTH GENERATION" sparring weapons. Weapons which were not intended for Pre-1700 HEMA but have been adapted by some groups. These weapons are only marginally suitible for pre-1700 HEMA, either due to inaccurate or unrealistic performance or realism, and / or poor safety characteristics. Still used by a lot of EMA groups and by some HEMA groups for a small amount of sparring, especially with beginners. Appearance: Poor to fairly Good depending on hilts etc. Used by LARP groups, not used by any HEMA groups that I know of. 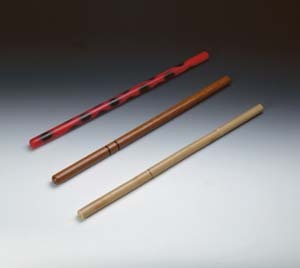 Widely used for Kendo. Used by some HEMA groups. Safety: Good for thrust work only, requires fencing mask, gloves and gorget are a good idea too. Realism: Medium - Good for thrusting weapons of a certain type, too short and wrong weight for rapiers etc. Used by some groups for rapier training as a stop gap, the Foil, and the Epee in particular are actually a good simulators for 17th-18th century smallsword fencing, and when used for this type of martial arts could be considered THIRD GENERATION sparring weapons. Safety: Medium - Lighter than a steel blunt, Requires use of gambeson, mask, gloves and some joint protection but can be used close to full speed for cutting only, not suitible for thrusting without heavy armor. These have been used in movie stunts since at least the 60's. They are used by some EMA groups. Some individual HEMA practitioners use them as well. Used by some large HEMA and EMA groups and by many individual practitioners. Cost: Medium - They have to be home made generally and the materials can be a bit expensive $10 - $30? These utilize Sch 80 pvc cores and orthopedic foam for flat edge geometry and thin cross-sections. Realism: Medium to Good- Good for striking and thrusting, Medium at bind with use of lubricant. Appearance: Medium - Better appearance than other padded weapons due to use of covering material. Cost: Medium or High depending on shipping distance ?? Not certain of the exact price. These have a very professional looking silver synthetic covering. Safety: Good - Safe for striking, less for thrusting, weighted cross unpadded. Cost: Low - $10 - $30? The precise makeup of these is still being experimented with but they are very popular. Safety: Good - Requires use of gambeson, mask, heavy gloves as well as arm and joint protection to be used close to full speed. Used by many HEMA groups. These are based on Renaissance era originals. Safety: Good - Requires use of gambeson, mask, gloves and some joint protection but can be used close to full speed. Lighter than wasters, they bend on hard impact but can be bent back. These are used by some of the top HEMA groups, but current availability is limited. When you evaluated Lance's padded swords, did you use his standard line or the performance versions? I've just recently got a cache of the performance models, and they're head and shoulders above in realistic play when compared to his earlier models. I'll be writing a full review of them after this weekend, when we fight our first tournament of the season with them. I look forward to your review. I have not had a chance to ever handle one of Lance's swords, I'm basing my evaluation on reports from other people, and from what I can see in the many of Lance's sparring videos. The new performance models look excellent. I have actually been talking to Lance privately about developing a "FOURTH GENERATION" sparring weapon. Your ideas on the latter would also be welcome. EDIT: If I have said anything incorrect in any of my general assessments, about the RSW or any other weapon, please correct me. I hope I have been fair and even handed but my knowledge is not alas, universal nor my judgement infallibale. I think you have miscategorized "Olympic foil/epee/sabre". The three "modern" fencing weapons have been essentially the same for more than a century. Except for the blunted point, today's epee is pretty much the same as the late 19th century dueling swords. The foil was used as a training weapon and sport weapon for a long time. The modern sabre is lighter than the old dueling sabres, and has a straight blade, but is still a valid simulator for much of the repertoire. A modern epee or foil with a French or Italian grip is just as good as an old one, and a sabre with an S2000 blade is a good start. All three weapons are good for thrust work, and the sabre is good for cutting, if used correctly. Also, why reinvent the wheel? A standard mask, glove, and fencing jacket (or equivalent) should be all you need if you are correctly using these weapons. An underarm protector is required for competitions, due to the increased vigor and poor distance judgment that is likely in that setting. Additional protection like a gorget is only important if these weapons are being used inappropriately. Thanks, I should have been more precise about my definition of HEMA. I really mean martial arts as practiced before a certain time period, exactly what the cut off date should be I'm not certain, but I would tentatively place it around 1650 or 1700? Other folks may disagree with me on that. The definition of what constitutes the HEMA period is an important aspect of defining this typology. I would agree with you that the epee is probably a very good simulator for the smallsword, the olympic style saber however is not even remotely suitible as a simulator for a real saber in my opinion. I'll add a qualification to the entry for the foil / epee / saber. I would consider the smallsword on the perifery of the period which I'm interested in, the period where the martial arts associated with such hand weapons had a major military as well as civilian importance. I realise sabers and weapons like pallasches were used in combat into the 19th and even 20th centuries, but I was under the (perhaps mistaken) impression that the martial arts associated with these weapons had declined somewhat after the 17th or 18th century. Please correct me if I'm wrong as I may very well be, this is not the period I am familiar with. And while the smallsword very definately continued as a martial art, the degree of specializatoin takes it out of the realm of what I would consider Historial European Martial Arts, and more into a Pre-Modern or Modern type. Again, this is very arguable. Well, I disagree with your restriction of the term HEMA on semantic and philosophical grounds. Semantic: History didn't stop in 1650 or 1700, and the duels fought in the early 20th C. are absolutely historical. If you want to restrict your time period, add a descriptor, don't co-opt an existing definition. Just say "pre-1700 HEMA" for example, which makes it clear to everyone. Philosophically: There were very real duels being fought with swords into the early 20th C. Also, militaries around the world spent a lot of time training sword, bayonet, and lance use throughout the 19th C. Saying that the martial arts associated with these weapons had declined seems rather arbitrary and incorrect to me. Similarly, in respect to the smallsword, specialization removes it from the definition of HEMA? Don't forget that smallsword use against other weapons was also taught. There are many types of real sabres! The modern sport sabre is an ok simulator for a dueling sabre as long as you don't want to do anything that requires a curved blade. It is a terrible simulator for an infantry or cavalry sabre, or any of the other heavier sabres. Again, it sounds like you are defining anything in your time frame of interest as real, and everything outside your time period of interest as somehow less, or not real. I'm not trying to get you to love other time periods, just to be fair and accurate in your terminology, and not say something general but mean something specific. I don't really understand why the flexible steel rapier ends up in generation 2? I mean, Darkwood's blades are as close as on can safely get to a real rapier in my understanding, they are used in full contact sparring, and were rediscovered quite recently if I'm not mistaken... Wouldn't that make them generation 3? I'm also a bit disturbed by the separation drawn between the shinai and the "modern" fencing weapons. I could be wrong about that, but it seems that they appeared roughly at the same time, in the same context ("peaceful practice"), with the same drawbacks (distortion of balance and weight, specialization) and advantages (unmatched safety). To me they should end up in the same category, though for diametrically opposed uses. That said, I don't spar a lot, so this is based on what I read and know about the history of the weapons. I put them in Generation 2 because they are restricted to thrusting only without heavy equipment. Part of the criteria for Generation 2 was that the weapons were restricted to thrusting only (like rapier simulators) or cutting only (like the aluminum wasters) without relatively heavy protection. That is certainly arguable since you could assume that a rapier is only really for thrust, but I believe some fencing masters for rapier did advocate a certain amount of cutting. Of course that also would depend on which era of rapier we were talking about, I'm no expert on rapier combat but I believe more cutting was done in the earlier part of the period. Again this typology is tentative and I'm not trying to enforce my views on anybody, I'm asking for your input here so thanks for contributing your thoughts on this. If there is a consensus that rapiers should be considered Generation 3 I'll move them. I don't understand what you are saying exactly (I don't understand which weapons you are comparing them to or which Generation you feel shinai belongs to?) I have them in Generation One because they are not realistic in terms of handling etc. Boffers are very safe as well but they are equally if not more unrealistic. Your input is appreciated, I'm only personally familiar with about half of these weapons. Well, I disagree with your restriction of the term HEMA on semantic and philosophical grounds. Semantic: History didn't stop in 1650 or 1700, and the duels fought in the early 20th C. are absolutely historical. Of course they are. I'm just trying to narrow the scope somewhat for the sake of managability, any dividing line is going to be somewhat arbitrary, but arguably there should be one. Oakeshott only went up to a certain point in his typology for example, this one will also not be all encompassing. I think it would be difficult to make sense of a typology which included bayonett, tomahawk, and entrenching tool combat. Similarly, I'm not talking about missile weapons here at all. Again I could be wrong to do this. If you want to restrict your time period, add a descriptor, don't co-opt an existing definition. Just say "pre-1700 HEMA" for example, which makes it clear to everyone. That is a good idea I'll adjust accordingly. , it sounds like you are defining anything in your time frame of interest as real, and everything outside your time period of interest as somehow less, or not real. I'm not trying to get you to love other time periods, just to be fair and accurate in your terminology, and not say something general but mean something specific. I'm sorry, if I conveyed that impression it was only due to my inability with the english language. I hope by making your suggested disclaimer I'll address this issue. The only reason I wouldn't venture much further than say, 1700 is that I'm simply almost completely ignorant of sparring weapons in use for simulating combat in this period, wheras I have been making sparring simulators based on Medieval and Renaissance era weapons for 25 years. My only interest is to make better sparring weapons not to belittle anyone. EDIT: Also the epee is already perfect for smallsword anyway so I (perhaps mistakenly) don't see any need for a new sparring weapon to simulate smallsword. That is certainly arguable since you could assume that a rapier is only really for thrust, but I believe some HEMA schools for rapier did advocate a certain amount of cutting. Of course that also would depend on which era of rapier we were talking about, I'm no expert on rapier combat but I believe more cutting was done in the earlier part of the period. Anyway I see your point. It just seemed odd to me to see no kind of rapier simulator in generation 3, while the flexible or semi-flexible blades do not seem overly more dangerous, even in cutting, than the Fetherfechters. I don't understand what you are saying exactly (I don't understand which weapons you are comparing them to or which Generation you feel shinai belongs to? I have them in Generation One because they are not realistic in terms of handling etc. Boffers are very safe too but they are not realistic. I was comparing Olympic style Foil / Epee / Saber (generation 1) with shinais (generation 2), in fact. I don't see why they are in different generations. To me the trade-off is similar, and the fact that the shinai is used in Japanese martial art does not justify the generation gap in my opinion. It's interesting because when thinking of classes of sparring weapons I split them into three categories as well. I think your generation 1 is almost my second category, and your generation 2 my first. Beware though, that employing the term "generations" could lead to mistaken assumptions. All three have their place and their good use, maybe sorting them into generations is a little pejorative for the tools in generation 1 (seems to imply that they are less sophisticated in a way). And they were not developed sequentially either, except perhaps generation 3 which is quite new. Although I understand that since you are interested in realistic sparring, sport weapons are less important to you. Great subject anyhow, best of luck with your classification! In looking at it again, I think you are correct. Shinai should be in Generation 1. I'm going to make that change immediately. I'll address your other points after I come back from drill this evening. That is certainly arguable since you could assume that a rapier is only really for thrust, but I believe some fencing masters for rapier did advocate a certain amount of cutting. I have to say that this part of the discussion disturbs me. OK, to start with, every rapier master described cuts, but that's a minor point. Do people really believe that you can't fence safely with accurate replica rapiers? If so, I'm horrified! If you can't fence safely at full speed with a fencing mask, a light to medium weight jacket and a buttoned full weight accurate replica rapier then you have no business bouting. There is nothing in the nature of rapier fencing that makes lighter or more flexible weapons necessary given what I would regard as a basic level of control . If you're saying that you can't fence safely, with both cuts and thrusts, with a full weight, stiff bladed rapier then you are saying that you do not have enough control to fence, full stop! Safety in historical fencing does not reside with the weapons or the protective equipment. One of the most horrific injuries I've seen was with a padded waster and occurred because of an assumption that the weapon was safe and no control was needed. In my opinion, 90% of your safety derives from your control and that of your opponent. You must know where your sword is at all times and be able to ensure that any impact on an opponent will not happen hard enough to cause injury. This control will also help you to win your bouts. Protective equipment is for those cases where you cannot guarantee absolute control. Protective equipment is a secondary safety feature, not a primary one. In rare cases where the weapons are larger and the style makes control harder (German longsword springs to mind with its forceful counterattacks leading to binds) then some sort of practice sword might be necessary - and of course practice weapons are useful for beginners, both on a cost basis and because they are still developing their control. Otherwise, if you can't fence at full speed safely with blunt steel weapons then you need to train more. I can't think of a type of single handed sword where competent fencers should need to use anything less than steel blunts. I also don't see why we should accept a level of incompetence that requires less accurate tools. No bouting tool (the term sparring was never used historically for armed encounters) that is even remotely like a sword is entirely safe. Therefore emphasising protective equipment and bouting tools as the basis for safety is grossly flawed. The only basis for safety is weapon control. To paraphrase Frederick the Great, control, control, Toujours control! I totally agree with you, Stephen. Though my “classical” experience is more with Karate then European sword fighting, I came across pretty much the same thing. Talking to the older karate-ka, they said that more people have bean knocked out sense the introduction of head protection then before. Karate-ka would stop controlling their punches to the head, and stop blocking strikes to there own head. It is the shock wave of the brain that knocks you out, not contact; so, they get hit, there head gets turned at a high velocity, and... they wake up a few minutes later! Also, more people have broken toes sense the introduction of foot protective gear! The pads are good for beginners, but inhibit real growth. Control beats all else! Yeah I have a very different philosophy than you do Stephen, I believe if you are always 'pulling' your strikes, OR thrusts in training, then you are not going to learn to fight with these weapons. I don't buy this concept (which I have heard many times) that you have to always control your strikes so that they do not land hard. Of course you are using control, but the principle purpose is to displace your opponents attacks and hit them. Hitting them soft is secondary, it is often done as a matter of courtesy, if you have the time and the luxury. But sometimes you don't and you need to be able to take it to that level or your will never learn true timing of a real fight. Or reach for that matter. Certainly we often do free-play as opposed to true sparring, which is lighter impact and slower speed. But I personally believe you do have to spar flat-out if you want to learn. I do not want to train myself in the habit of pulling every strike. It's quite possible that is because my primary focus has been 15th century longsword. 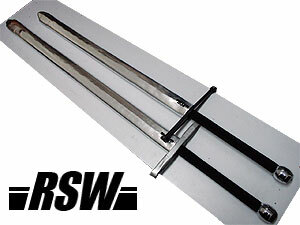 We do use flexible Steel rapiers in our group, we have used them for five years. They are almost completely safe IMO for thrusting, if you use a mask and a gorget, but I do not think a steel rapier is safe for full-force, full-contact cutting. For one thing, in a fencing mask, you have very little protection for the side of the head, and essentially none for the back of the head. Joints and hands are extremely vulnerable. So cutting at full speed is just out. We use them for thrust-work pretty much exclusively, with a little draw-cutting. Now again, whether you even believe in full-contact sparring is a separate issue. If you do not, certainly there is no need for new training weapon. Frankly I think the rapier and smallsword simulators are much closer to being ideal for training purposes than longswords, earlier single swords, messers, falchions, daggers or greatswords. But for something like an arming or cut-thrust sword you might use for I33, no metal simulator is safe unless you are, again as you have suggested, eschewing full-speed sparring. Free play yes, sparring no. Anyone who believes incidentally that full-speed, full-contact sparring is not necessary to learn how to really fight is welcome to show up at our practice at the corner of Gallier and Chartres streets in the 9th Ward, New Orleans, every Saturday at 10:00 AM. As long as you sign the release form, you can try out your technique on us. You can even bring a video camera to record your victories. IMO thats why the Karate guys got stomped in the UFC. The guys who did the most realistic sparring did the best. Everyone who did forms only got wiped out. Why do you equate full speed with full force? They are not one and the same. I swing steel swords the same speed that I swing the basket hilted shinai that our beginners train with. I just choose to hit a bit softer. I know for a fact that accurate replica steel rapiers are very safe for both cutting and thrusting at full speed if you exercise control because I and my students have done this for years. In 2001 I won the rapier fencing tournament at Western Martial Arts Workshop in New York. I was using an accurate replica rapier which was considerably heavier and stiffer than anything else being used in the entire competition. Nobody commented that I hit too hard and certainly nobody I defeated complained that I was fencing at less than full speed. Incidentally the weapon I used was outside the specs for the competition but the person who inspected the weapons before the comp. said "you know I shouldn't let you use this, but I've seen you fence, so go on." You stated, "But for something like an arming or cut-thrust sword you might use for I33, no metal simulator is safe unless you are, again as you have suggested, eschewing full-speed sparring." I did not suggest eschewing full speed. I always bout at full speed. You might care to look at the video on Maestro Sean Hayes site of his I.33 demonstration bout with me at Western Martial Arts Workshop in 2005. It can be found at http://www.northwestacademyofarms.com/ Click on seminars and you will find it about a third of the way down on the right side of the page. Unfortunately the video was taken with a phone and is not that high resolution, but you can get an idea of the speed. We had never bouted together in the I.33 system, were using correct historical weight steel arming swords and as you can see we don't hold anything back. At no point did I feel like I was in danger of being hurt and neither of us ended with a mark on us. Control! I am constantly told that I can't do what I do every training session, which is to fight at full speed with attacks launched strong enough to be lethal, but controlled so that they land light enough not to do damage. I can and not only do I do it, but I insist that my students do it too. Of course the other side of the coin is that if you're fighting with weapons that are light enough to allow full force hits then you can hardly fail to distort technique. Frankly I don't understand how anyone who has been taught proper technique could ever consider fighting full force ever again. I recall Bob Charron who won a great many SCA tournaments before turning to WMA, telling me that he could never go back to the SCA because if he swung a rattan cane full force the way he's trained to swing steel swords in test cutting, he's scared he'd kill someone. The argument that you need full force bouting is valid for things like boxing where an important attribute is to be able to take damage and continue fighting. The argument collapses with arts where one good hit should end the bout. I can train to box after being hit a few times. It's a little harder to train to continue fencing with a limb removed. So, in short, please don't try to tell me I don't or can't fence at full speed. I can and I do. I can do this with steel swords of correct weight and stiffness and land attacks sufficiently soft so as not to do any damage. I will not allow anyone who can't do this to fence with steel swords in my school. If you can't start an attack at full speed and then land it softly once you are sure it will hit then you have no place fencing. For the record, your fencing video seems to be missing from that website, so I cannot comment on that. I will say that I have met, fenced with, and trained with a couple of the best longsword fencers in the world and I never met anybody who could spar full speed with steel blunts safely. None of them had the title of maestro however. I'm not interested in turning this into a debate between the way I fence and the way you fence. If we ever meet in the same place I'd be delighted to put it all to the test with arming sword, longsword, messer, staff or dagger. We will have to use shinai or padded wasters though because I don't pull my strikes. If you feel that there is no need for better training simulators, then you by definition have no interest in an improved sparring weapon. So there really isn't much to talk about. You disagree with the need for specialized sparring weapons beyond what already exists. Since you have stated that you can bout full speed with steel blunts without the slightest danger of injury, I can't imagine why you would ever need anything else. My idea of a typology, and the subject of this thread are aimed at that I think large subset of HEMA practitioners who are less than perfect fencers, cannot bout full speed with steel blunts safely, and are in fact interested in new training simulators. I'm not telling you what you can or cannot do, I really don't care how you spar. I know for a fact that hundreds of HEMA practitioners use either padded wasters, modified shinai, nylon wasters, or aluminum wasters because they feel they need training simultors which are safer than steel blunts. I am trying to do something for these people, and for myself. If you don't agree thats perfectly fine, keep doing whatever you want to do. I would never tell you that you had to use a safer training simulator unless I was fighting you myself. Of course the other side of the coin is that if you're fighting with weapons that are light enough to allow full force hits then you can hardly fail to distort technique. I am compelled to remind you that, as stated in the Typology above, the Third Generation sparring weapons are all of accurate weight and balance. The padded wasters we use are of identical weight and balance of real swords. To the ounce, and to the centimeter. I will also comment that I own several sharps including an Albion blade and have done a rather immense amount of test cutting on all manner of materials including things like pigs feet, chickens and turkeys from the supermarket, and etc. I do not agree with the assumption that a very light hit will always cause an incapacitating or crippling injury. A two inch thrust can kill, but it has to hit a vital area (or pierce the rib cage or skull) and in most cases, will not necessarily kill instantly. Not before your opponent strikes back and gives you a mortal wound of your own as did in fact often happen in rapier and smallsword duels historically. If you are pulling your strikes you are going to mess up your follow-through. This is a huge problem I have seen with people who are used to pulling their strikes when they try to cut, they sort of flinch at the target and either mess up their edge alignment or fail to follow through. I saw it happen tonight in fact with a guy who has an olympic style saber background. A lethal cut requires proper follow-through at a suitible velocity. You aren't going to learn to do that in a combat situation if you are pulling your strikes constantly or sparring at less than full-speed. It maybe strange that I propose such an idea as a padded sword maker but it was Bill Grandy's sparring videos that first enlightened me that one could spar with blunt with almost full speed and still safe. The difference in speed, in my opinion, is about 10% only and I would like to give Bill my praise that the speed he used with blunts was high enough to defeat most of us here in Hong Kong. He showed a very sophisticated degree of swordsmanship in speed and control. I also agree with Stephen that full speed is not equal to full force and thrusts take virtually no force to penetrate. Sometimes I explain to my students with an analogy. Unlike blunt weapons like staff that required certain hitting power in order to do its' work, forcing the user to generate a lot of power in each strike, sharp swords are like "rechargable batteries" where one already stored the force in the edges during the sharpening. I sharpen my own swords and it was really quite exhausting. Thus, in combat, one doesn't have to put a lot of forces in the strike for it was already "charged" and once the blow connected with good blade alignment, an tremendous force stored in the edges will work itself through the target. Of course the "charged force" will deplete itself along the battles through hitting something hard, like shield rim or armor or sword and once the "charged force" was totally depleted, it was not much different from a staff where each strike would require the user to put more force into each blow in order to inflict enough damage. Anyway, based on my earlier experience (I go to Stoccata in Sydney for more than a year now) it seems to me that it is far easier for me to not pull the blade when it hits. It's just so much easier to just allow the blade to do whatever it wants, which is to land, smack, as hard as it can upon an opponent. When I first began people complained that I hit them too hard with my modified shinai. It took me a while to gain the control needed to hit soft (which is why I waited a long time before considering a blunt blade). Also, who said that you've got to kill your opponent to win a fight? From what I've heard, there were duels where the one who first "drew blood" wins. Besides that, if I hit my opponent and he didn't hit me, no matter where and how deep the cut is I still would have the advantage since he would be in pain or losing blood and that alone would affect his performance. Finally, you don't need to be able to cut newspapers to cut flesh. I hope I don't sound like an idiot, but that's my two cents.